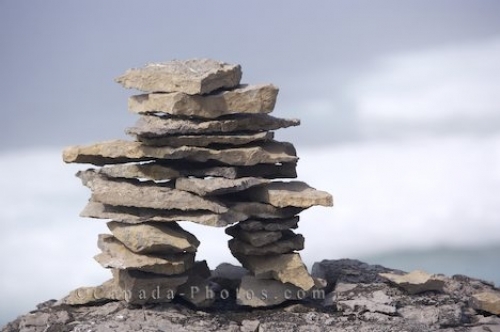 A rock sculpture or an Inukshuk atop a rock overlooking Sandy Cove along the Labrador Coastal Drive in Southern Labrador where pack ice is hidden behind the fog. A sculpture such as this can be very time consuming when creating it and each rock must be strategically placed in order for it to stand properly. Near Sandy Cove along the Labrador Coastal Drive in Southern Labrador there are the ideal rocks to build your sculpture upon that overlooks the ocean where pack ice has made its way into the cove behind the Labrador fog bank. Rock Inukshuk on a ledge backdropped by pack ice veiled by fog in the Strait of Belle Isle, Labrador Coastal Drive, Highway 510, Viking Trail, Trails to the Vikings, Southern Labrador, Labrador, Canada. Picture of a viewpoint where a rock sculpture or Inukshuk sits on the rocks of Sandy Cove along the Labrador Coastal Drive.